Hope you guys are having a good weekend? After a bit of a miserable two weeks, my energy levels are finally almost back to normal and I am almost well. It feels amazing to be able to do simple, everyday things without flopping out in between tasks. Being ill really does give you a renewed perspective on life and on what’s truly important. I am sure you can all relate? Thursday saw me bouncing off the walls as I was finely able to wash my mega greasy (eugh) hair without the fear of making myself ill again and then the good day continued as we found out that our house purchase is finally going through! We are likely to get the keys by the end of the month! Hooray! We are both so excited about this one as it was taking so long that I started having doubts about it actually ever happening. We are both thoroughly fed up with renting, especially that we found that having a cat makes it impossible to be able to rent a nice, modern place in the UK, no matter how well-behaved she is. We cannot wait to make the place our own and we are also super excited for Tina as, while our current place with its large garden was chosen with her in mind, we have been extremely unlucky. There is an un-neutered tomcat next door who attacks Tina every time she ventures out and his owner isn’t a nice person either. Not only does she refuse to do any kind of time share arrangement, but she actually spreads rumours that it is out cat attacking hers! Poor Tina. Seeing her sniffing around and poking her head into things in our new garden is probably the sight we are both looking forward to most! We can only hope that our new neighbours don’t have an aggressive cat too. 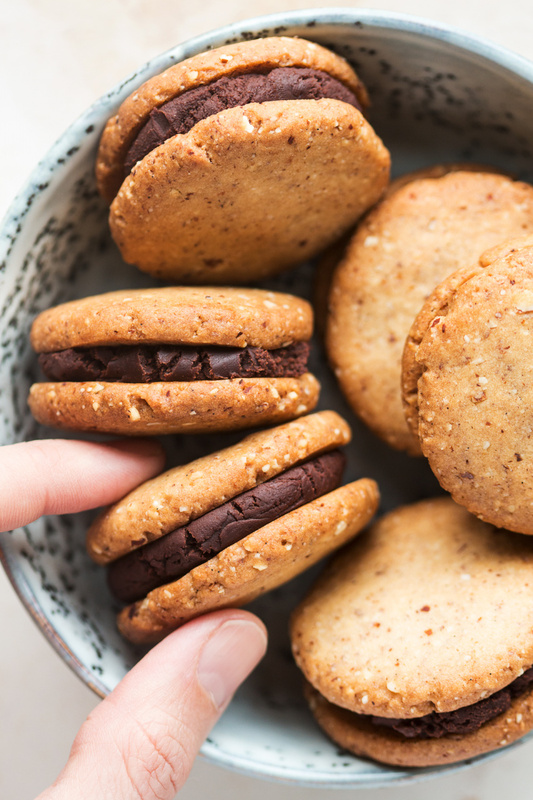 While I was ill I was often dreaming of cookies – I dream of cookies a lot, generally 🙂 . Luckily Duncan’s words of wisdom ‘sugar is really not what your body needs right now’ did stop me a few times and I managed to distract myself with a book rather than shoving sweets into my mouth just because I was feeling miserable and sorry for myself. 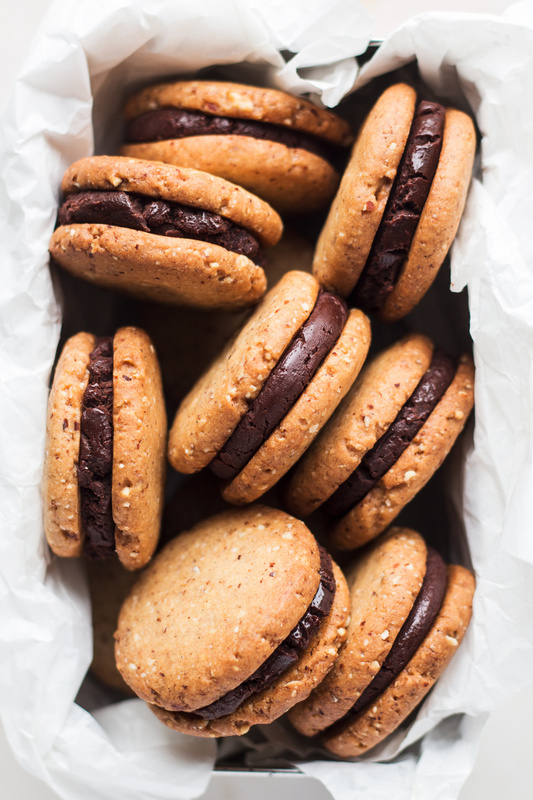 Now that I am well though, I’ve decided that a new cookie recipe is in order and so I bring you these delicious amaretto (I want to use up the bottle before we move) sandwiches filled with an indulgent ganache. 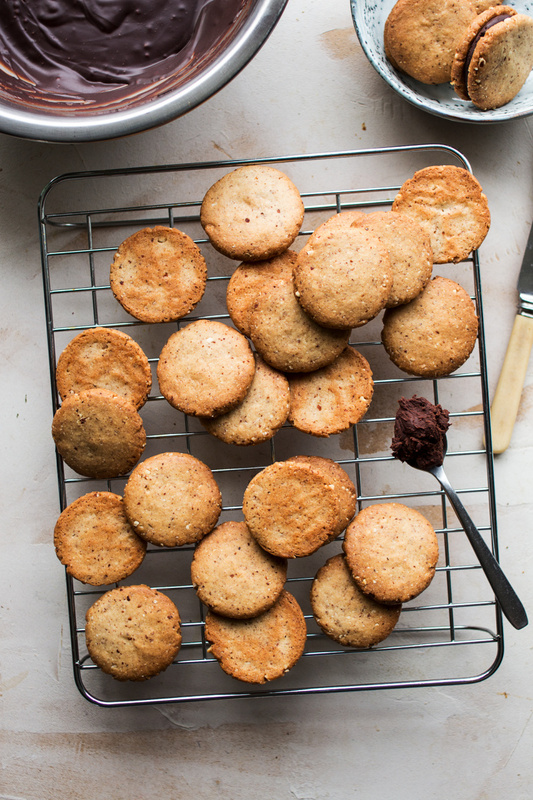 They are not difficult to make and they make delicious coffee companions, perfect for the weekend in this stormy (it’s blowing a gale and chucking it down massively as I write this) weather. Enjoy! PS: If you make my vegan cookie sandwiches, don’t forget to tag me on Instagram as @lazycatkitchen and use the #lazycatkitchen hashtag. I love seeing your takes on my recipes! In a bowl, whisk up maple syrup, oil, vanilla and almond essence until well combined and sort of gelatinous. Place a fine sieve over the bowl and sift in flour. Fold it well into the wet ingredients together with salt. Finally fold in ground almonds / almond meal until fully combined. You may need to go in with your hands at the very end. The dough should be thick and sticky. Refrigerate the dough for 30-60 minutes at least. Pre-heat the oven to 180° C / 355° F and divide the dough into 30 even (17 g each) portions. Place the dough balls on a baking tray leaving some room around each cookie. Flatten each ball with the palm of your hand or an upside down glass. Bake for about 15-18 mins. 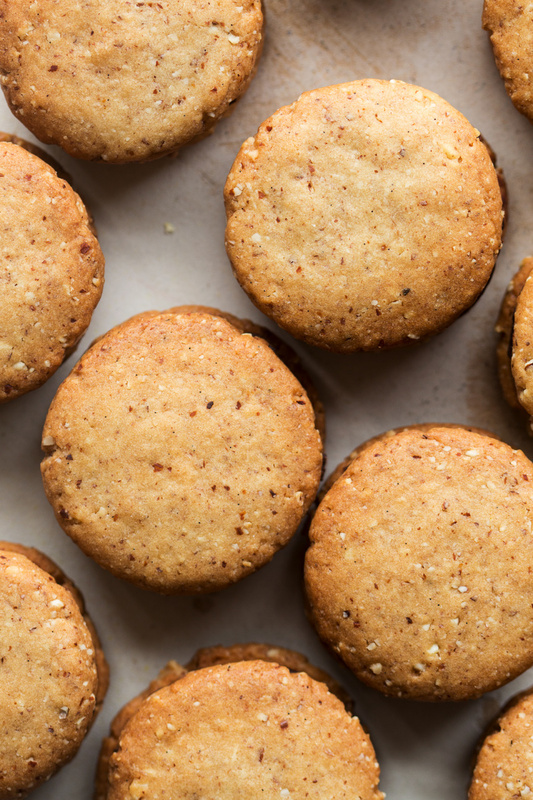 Remove the biscuits from the oven, transfer them to a cooling rack and let them cool down completely. 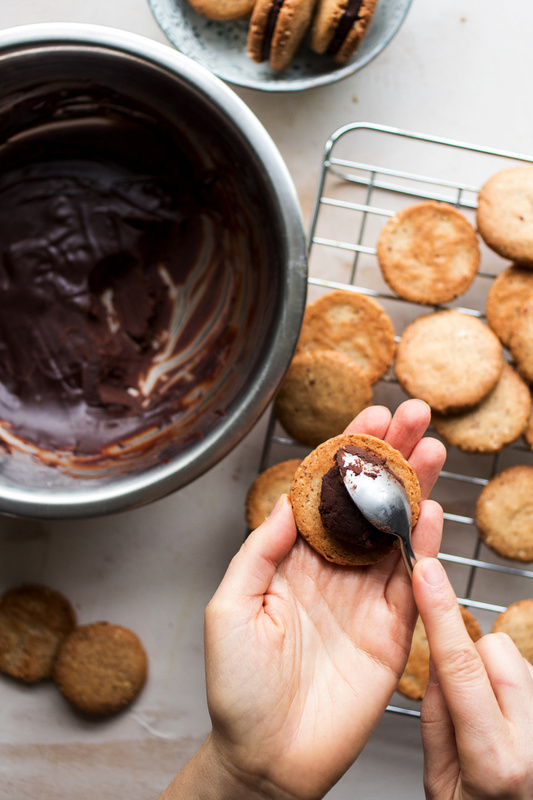 Place a teaspoon (or so) of ganache at the bottom of half of the cookies and top with the other half. Store in an airtight container for a few days. Place roughly chopped up chocolate in a large glass or metal bowl together with coconut milk. Place the bowl over a pot of water (make sure the water does not touch the bottom of the bowl) and bring the water to a gentle simmer. Simmer gently, without stirring, until all the chocolate has melted. Take the bowl off the heat and whisk the coconut milk / chocolate mixture until combined. Mix in maple syrup and amaretto – if using less amaretto, compensate by adding almond milk instead. If your ganache seizes – becomes thick and loses its shine – you can recover it by whisking in a tablespoon of boiling water. When the mixture cools down, cover the bowl with cling film and leave it in the fridge for a few hours (or overnight) until it has hardened. Let it sit at room temperature for a bit before filling the cookies. *If you don’t want to use alcohol, substitute amaretto for almond milk. You could add a few drops of orange essence and a zest of one orange to the ganache for chocolate orange flavour instead. My cookie recipe is inspired by this recipe and my ganache recipe is adapted from this recipe.